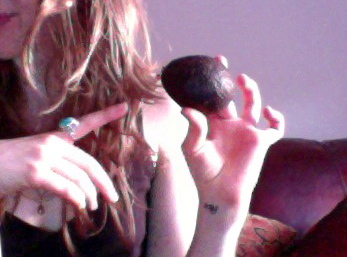 So, remember that time I smeared avocado on my face? Eating it also happens to be pretty good for your skin. Tuesday night, I spoke about nutrition for healthy skin at a super-fun fitness event in New Jersey, put together by a consultant from Rodan & Fields, who talked about some of their awesome products. Participants were also treated to healthy snacks and a free kickboxing class. Here’s a little cheat sheet version of what I covered at the event. Here’s how to nourish your skin from the inside out! Eat a Balanced Diet: Consume regular, balanced meals and snacks including: fruits and veggies along with lean sources of protein, legumes, nuts, seeds, whole grains and healthy fats. Eat the Rainbow: Pigments in fruits and vegetables such as the beta-carotene that gives carrots their brilliant orange color can also make your skin glow. Pay Attention to Antioxidants: Antioxidants are substances that may prevent or delay cell damage caused by free radicals. Popular sources include: fruits, vegetables, red wine (and champagne! ), dark chocolate, coffee, and tea. Choose Supplements Carefully: Aim to get your vitamins and minerals from food first and use supplements to fill in any gaps (for example, iron and vitamin B12 for vegans). A few exceptions: many of us, especially in the northern states (especially in winter), would benefit from a vitamin D supplement. You might want to consider fish oil as well. Use Sugar Sparingly: Inflammation caused by rapid sugar breakdown leads to sagging, wrinkles, and exacerbation of conditions like rosacea and acne. Sugar also deactivates the body’s natural antioxidant enzymes. Save the sweet stuff for special occasions and check labels for hidden sources in processed foods. Drink Plenty of Water: Hydrated skin is happy skin. Aim for 8 cups a day to get your glow on. Your needs may be more or less, depending on age, activity level, and other factors. Go Easy on Alcohol: To avoid wrinkles and blotchy, tired-looking skin, stick to one drink per day for women or two for men. Maintain a Healthy Weight: Excess weight has been linked to inflammation and related skin problems like acne, sweating, and impaired wound healing. Being underweight can cause skin dryness and a pallid appearance. Get Enough Sleep: Aside from keeping “hunger hormones” leptin and ghrelin in check, sleep gives the body a chance to repair and regenerate tissue. Also, when we’re tired, we’re more prone to stress, another known skin irritant. Know Your Triggers: Keep a food journal and note skin’s appearance before and after eating to help you identify problem-foods if you suspect something is causing a reaction. Don’t Smoke: All the antioxidants in the world won’t offset damage caused by the free radicals introduced to your body when you light up. Are there any particular foods you try to include—or avoid—to keep your skin healthy? This entry was posted in Uncategorized and tagged diet, events, fitness, health, NJ, nutrition, skin.